The Public Relations Society of Japan (PRSJ) and its International and Networking Committee have organized overseas study tours for its members for several years. The tour took place over three days, from February 6 to 8. Thirteen PRSJ members participated on the tour and headed to New York, a hub of economic and media activity in the U.S. The main themes of the study tour, rooted in the latest global PR trends, were digital PR and content marketing. 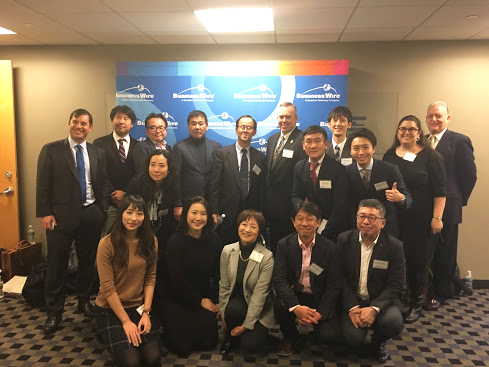 The group attended presentations given by three major players in the global PR field (Allison+Partners, Ketchum, and Weber Shandwick), and learned about the recent trends in U.S. media by visiting the offices of the news agency Associated Press, Business Wire and NHK’s New York branch. The presentations given by the three PR firms, interspersed with case studies, illustrated how the U.S. PR industry has already shifted to the PESO (Paid, Earned, Shared, and Owned media) model, how the boundaries between advertising and PR are becoming increasingly blurred, and how the importance of measurements in social media has grown. Each of the firms has their own culture and scale, and the differences were interesting to observe. While Allison+Partners discussed digital case studies and management-related topics such as their unique HR strategy, Weber Shandwick offered a lecture given by a famed strategist and Ketchum showed off a long line of successful projects; the visiting group thoroughly enjoyed each presentation. The group also had the opportunity to attend a special seminar given by Jim Harff, Global Communicators CEO and a prominent PR consultant on the recent presidential election and the Trump administration. 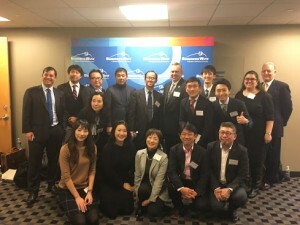 As a part of the tour and PRSJ’s cooperation with overseas PR organizations, the group also visited the Public Relations Society of America (PRSA) headquarters. The visit included an introduction of PRSA’s activities and lively discussions on the future relationship between the two societies. Reflecting on their visit, participants described the tour as a great opportunity to learn about the latest trends in the U.S., think about the future of public relations, and gain inspiration for their work. The Committee for International Affairs and Exchange plans to hold a study tour reporting session, which will also serve as a special international seminar on the current circumstances in the PR field in the U.S., for PRSJ members in May or soon after. We hope to see many of you there!